Teff is a warm season annual grass native to Ethiopia. Plants are fine stemmed with large crowns and many tillers. Roots are shallow and develop a massive fibrous root system. Plant height at maturity is typically 3 to 4 feet, but varies depending on variety and environmental conditions. When harvested at the proper stage, crude protein will normally be in the 15% to 20% range. Teff has an open panicle type seed head. There are approximately 1.3 million seeds per pound. When seed is coated at 50% there are approximately 650,000 seeds per pound. Teff is widely adapted throughout the United States and can be cultivated under a wide range of environmental conditions such as on marginal soils under water logged to drought conditions. Teff seed will not germinate well in cool soils. Plants are highly susceptible to cold and will die if temperatures drop to 32 degrees or lower. Teff is easy to establish due to its rapid germination (3 to 6 days) provided seed is planted in a firm seedbed and the soil temperature is 65 degrees or higher. Plant after all risk of frost has passed. Seeding rates are 8 to 12 coated pounds per acre or 4 to 6 raw pounds per acre at a seeding depth of 1/8 to 1/4 inch. Planting deeper will usually result in a complete stand failure. Stand failures may also occur when planting after small grains unless the stubble is thoroughly incorporated into the soil. Initial growth is slow until a good root system has been established. In general, 50 pounds of nitrogen per acre at planting will be adequate for good forage production. Small amounts of nitrogen may be needed after each cutting, however, too much nitrogen causes severe lodging. Soil testing is important since teff needs adequate phosphorous, potassium and sulfur for optimum growth. 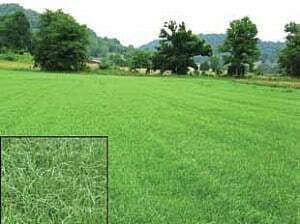 For optimum forage quality, teff should be harvested in the pre-boot to early boot stage, approximately 45 to 50 days after planting at a cutting height of 3 to 4 inches. Harvest regrowth in 30 to 45 days depending on environmental conditions.